Inbound Link Building is one of the most effective techniques to improve the visibility and performance and of websites, blogs, videos, and other web assets in the search engines. One of the most effective ways to build inbound links back to these assets is to publish content for distribution to other directories, websites and blogs. Ideally, links should come from as many different sources as possible - preferably those that are relevant to the legal industry. In short, the perfect world is to have a one-to-one ratio of links to linking domains due to problems inherent to bleeding links. Of course nobody ever achieves this ratio but is is always a good objective to keep the links /domains ratio as low as possible. - Article syndication to build back-links to your website: There are more than 4500+ active legal blogs in the United States and new blogs are added each and every day. Many of these blogs needs good content to add to their blogs so by providing free use of your article along with a link back to your website in your article, you are created a win-win scenario for both the firm that needs more content and you who need more textual inbound links. 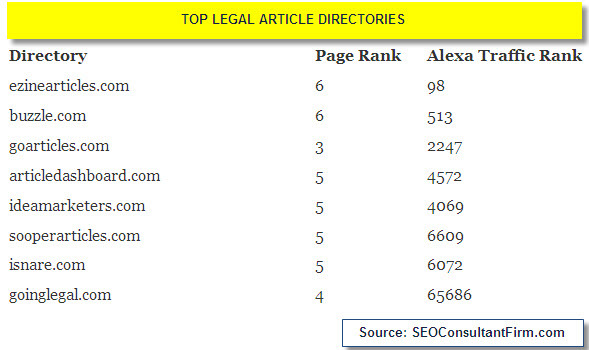 - Free articles from use on your blogs: As stated above, there are a growing number of legal blogs that ideally need active content additions at least 1-2 times a week. Unless the firm has shadow writers for their blogs, the reality is that most will not have the time, discipline and resources needed to create all of this content. 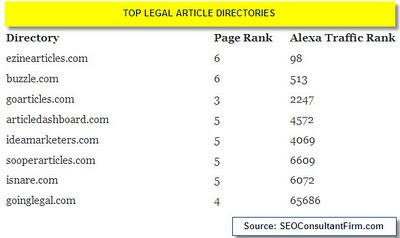 Article directories now allow you to easily find legal articles by practice area and use them on your blog - for free. - In-house counsel visibility: A recent study of in-house counsel attorneys show that 27% place a high importance on attorney blogs when doing their research. In addition to adding articles to your blog, you can further cast your net by providing this content to other blogs for use - creating yet another place when an in0house counsel may be able to find you when they review the "about the author" information on the article.